Culture, Life on earth, Photos and videos, Science? Survived, yes? – And now? Facing a disaster – what can you do? What can you do when your house has crumbled down and your work and income were bound to the place where you live? I guess it hasn’t happened to you, but there are folks which are truly left alone with that problem. Today we decided to drive into the area where many villages and towns were heavily compromised by strong earthquakes from August 2016 on. We live about 50km as the crow flies from the epicenters of these earthquakes. I felt them strongly, nothing happened here to my house, but o boy, it did destroy more than I had feared. Driving to the earthquake area – a real shock! 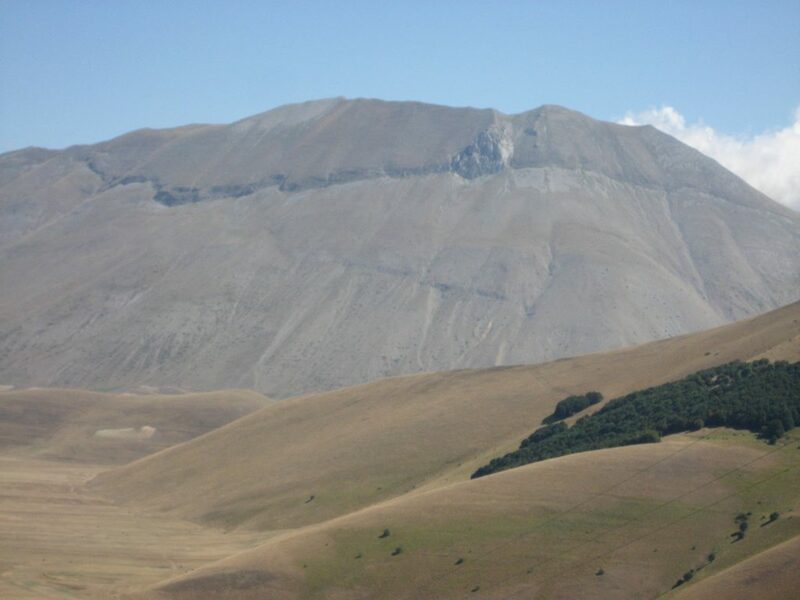 It is only for 2 weeks (after 10 months of inaccessibility), that one road has been opened into the area, from Norcia to Castelluccio on the high plateau of the Sibillini mountains. Some parts of the road were completely renewed, others limited to one track and you see the outer part of the road hanging down, and heaps of rocks, as you would expect. Then the view opened up to the plateau – and WOW. A huge crack runs over the mountain chain now, the rock has broken open over many kilometers. I remained in awe considering how much power had been released to split the mountain. 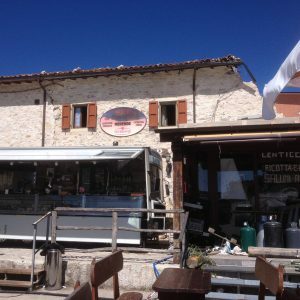 Finally in Castelluccio, the village of the famous lentils: I had been there many, many times. Only a few years ago the last of the previously abandoned houses had been rebuilt and tourists came to visit the village or even buy a tiny house, especially people passionate about Hang Gliding, as a school had been founded in this place. 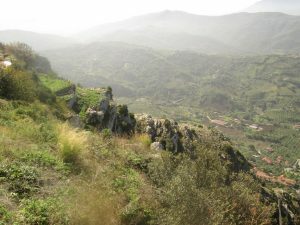 See here what is left of the village. 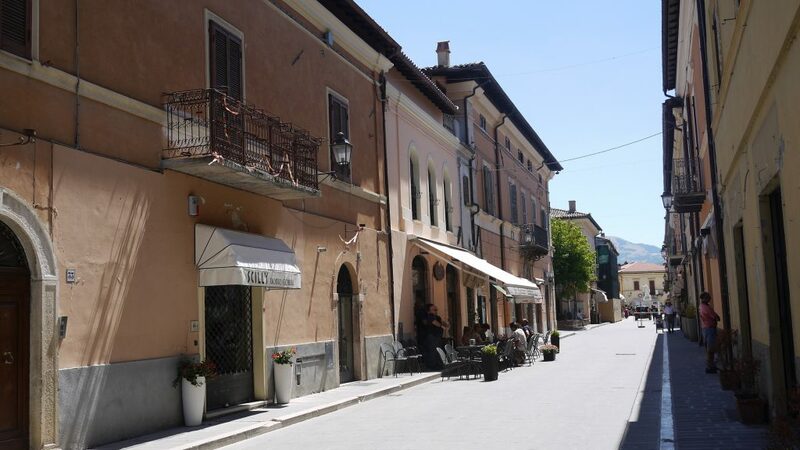 I took this photo from the spot where during my last visit two years ago I had sat on the porch of a bar and specialty shop, enjoying the delicious local food. 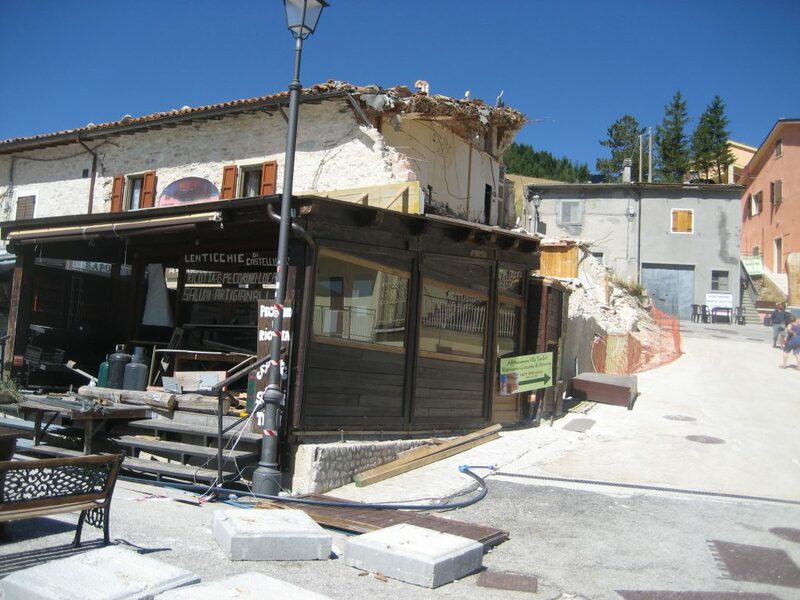 The building of the bar has collapsed, the shop and bar-service are now offered from a trailer – and it is only for these last few weeks that a handful of people show up again and buy their stuff. And the 10 months in between? Talking with the owner I mentioned that they are very unfortunate because they are left alone in their misfortune. WE ARE LUCKY BECAUSE WE ARE STILL ALIVE – was his answer. Wow again! He told me a little about the event and what happened later. 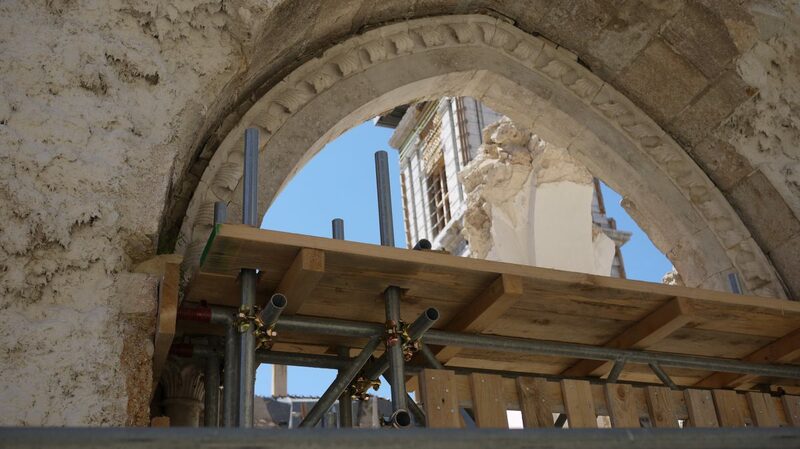 From last August on, when the first earthquake hit about 25km to the south – when 300 people were killed – everybody living in that area was on high alert. And when 2 strong earthquakes hit 4 days before the big one, everybody went to sleep in campers or tents – and that’s why they survived. A witness reported that during the strokes he wanted to leave his camper but the surface of the street came up, right into his face, the waves were incredibly high. He still lives – or lives again – in his camper near the mobile bar and right next to the container-station of the military – who don’t seem to be active or even interested in fixing anything, just wandering around, in 5 or 6, while the village is doomed in its state of total destruction. People who once lived there are not allowed to enter their houses, and the bar keeper himself had to fight to be allowed to come back and open his little activity in front of his destroyed property. 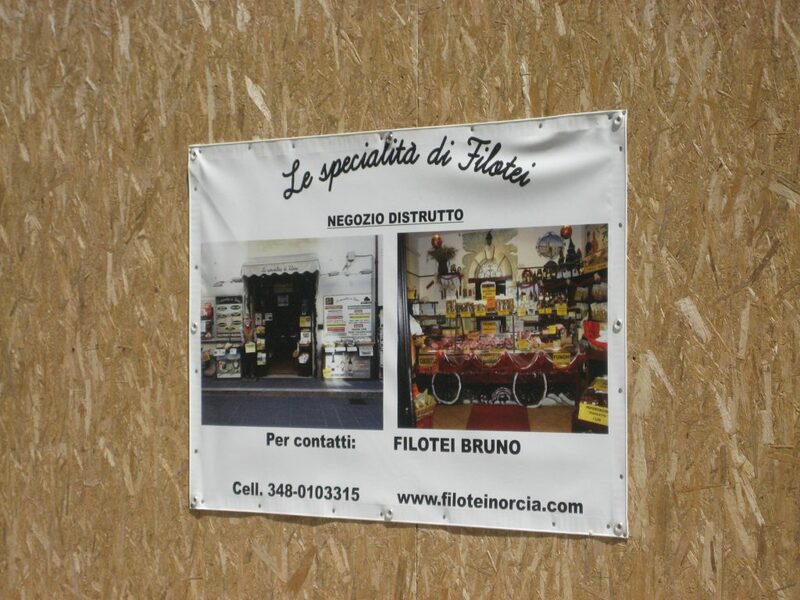 “Maybe in 30 years”, he said, “our shop will be in our house again”, With that, he expressed clearly the little hope for help which the people have in Italy to come back into a normal life. This is the common experience here. 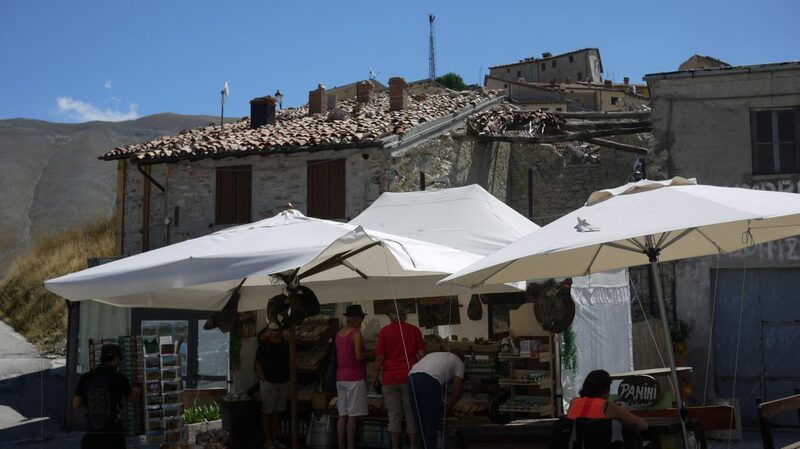 The historic city Nocera Umbra to the north of Assisi was totally destroyed in 1997. Now, in 2017, it is finally rebuilt, but with almost nobody living in the historic center anymore. After 20 years everybody has found some other place to live and to earn their money, not by choice, but by necessity. How long would you wait to come back home? How long would you be able to wait for coming back into your property? Two years? Three, maybe five? But 20 years is a long time. 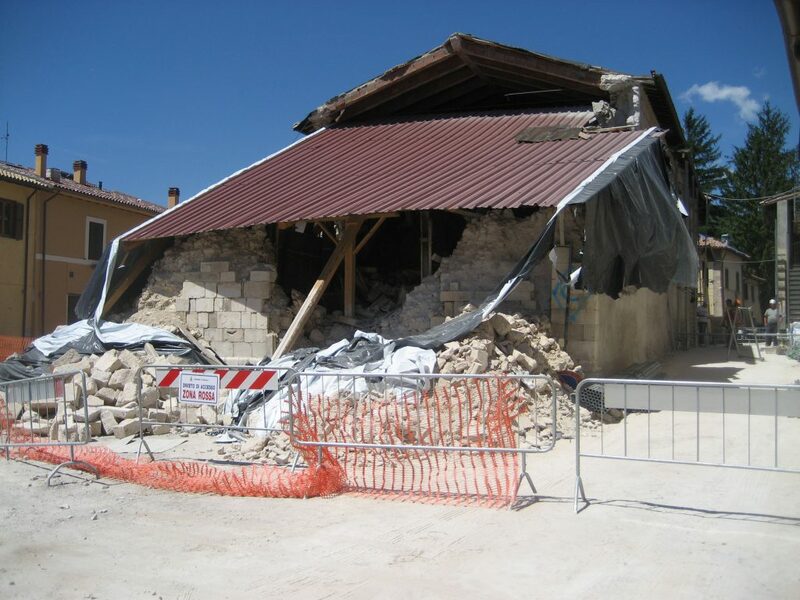 You cannot imagine what an earthquake of this magnitude can do. Officially – for many unscientific reasons (see my previous blog posts here and here)- it ended up with a magnitude of 6.6 in the records. Cutting a mountain in half needs a little more. The bar keeper said it was 8.0 and this comes nearer to the truth. It could have been 7.6 to 7.9, but certainly not only 6.6. The quake has moved the whole mountain. A hang glider told me that he could see from above that, in addition to the crack we can see from the plateau, there is another one right behind the mountain top which literally has cut it into two parts. Another unpredictable result of the event: the fountains in the whole area have dried out, the water veins have been blocked and the water has found a different way. It is now pouring out of the mountain near Norcia, in thousands of liters per second. This will change everything and, hopefully, the farmers find a way to continue to plant their famous lentils despite the lack of water. 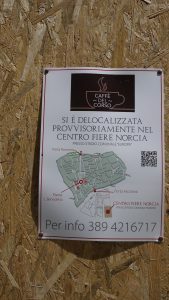 Hold on, I still need to tell you about Norcia, the city which was so proud to have resisted the first earthquake in August last year. 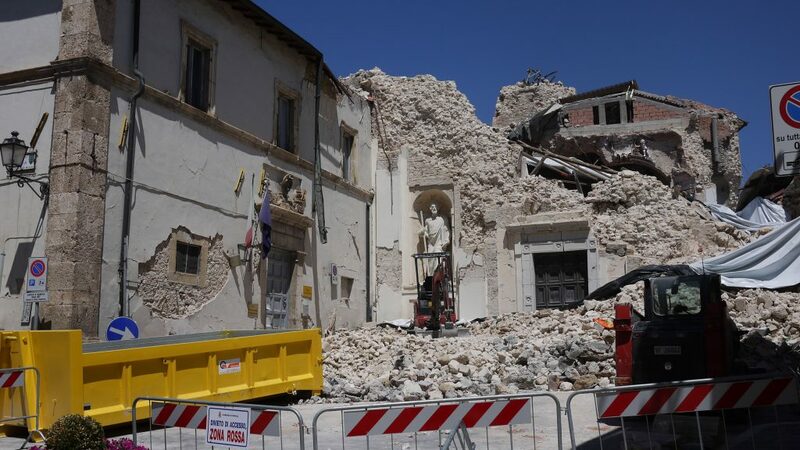 Norcia is now an incredible mix of “life as usual” and huge amounts of debris. 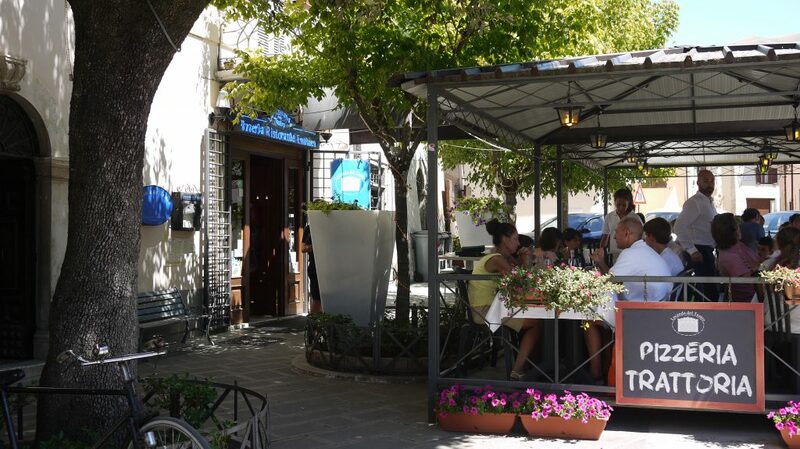 The inviting restaurant on the square in front of the theatre – the colorful life as usual. 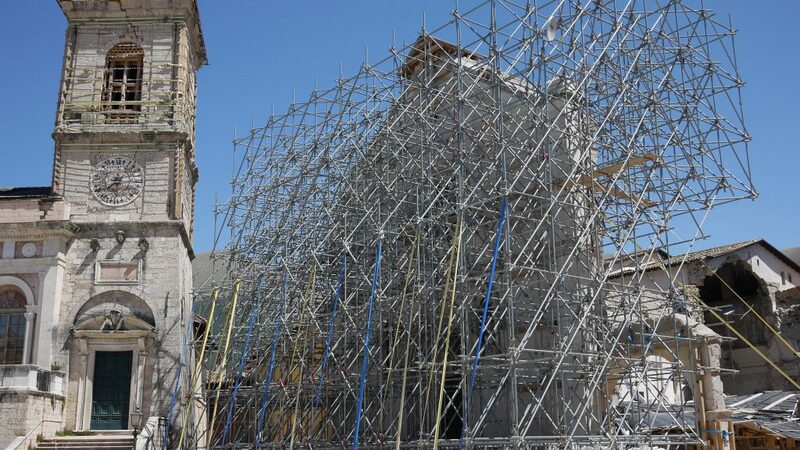 and two or three workers slowly beginning to erect some scaffolding: not to fix anything, no, but to just keep in place what has not yet fallen down. 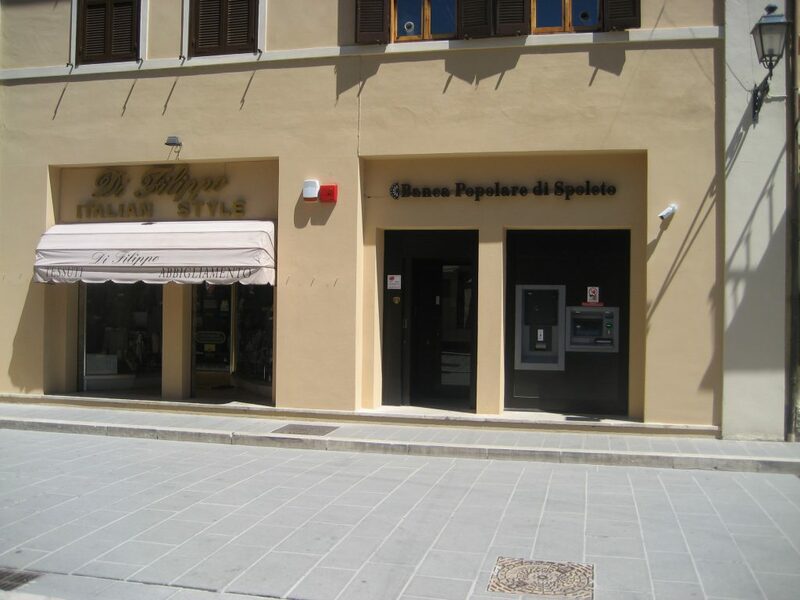 A bank in the main street neatly restored and the shop in the same building open, while right next to it abandoned shops and small announcements that they are still working, somewhere, outside the city. Whoever goes there and buys their goods? The tourists come and see the historic center and buy something there; they don’t drive to the industrial area to buy something which they couldn’t even desire without seeing it exposed while strolling by. So how do they make their living if they are not among the fortunate ones who are allowed to open their shops again in the center? ( I guess about 80% of the commercial activities are closed). And even those who are open again do not really have many clients. 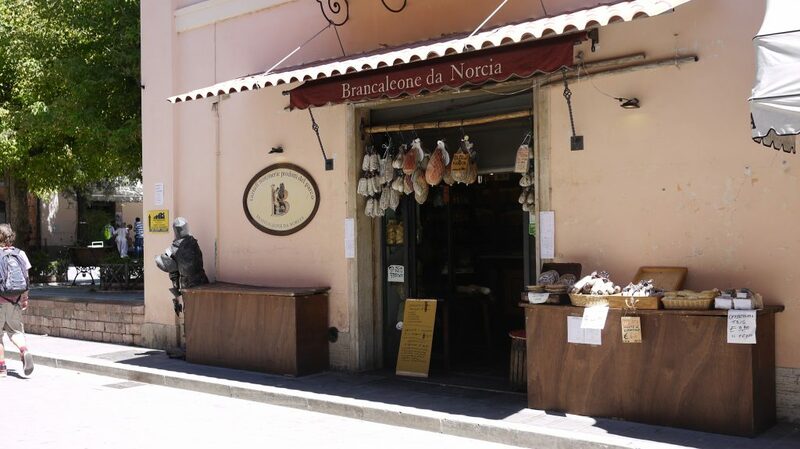 I have never seen so few people in Norcia in the past 30 years and my 20+ visits there. or are inaccessible like the town hall which seems as if still contemplating if it is better to tumble down, too, for giving a consistent appearance to the main piazza, where only the medieval castle sits perfectly in place like a flat rock. 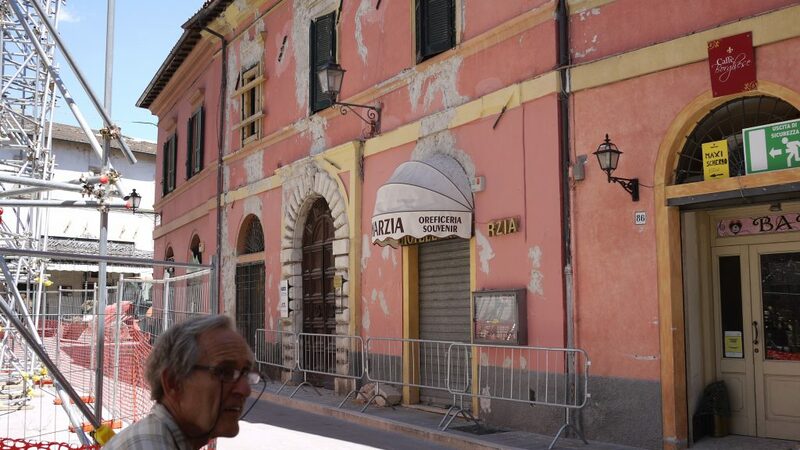 The town hall and the front facade of the Basilica di San Benedetto – the rest of it has crumbled down. How interesting is a disaster in the long run? Yes, some people are interested to come and visit these places, the “earthquake tourists”. 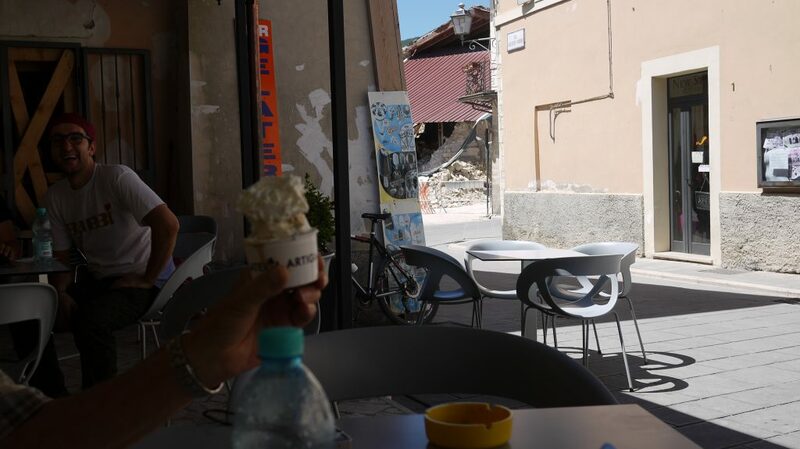 But most people come to visit Italy and the Italian cities for admiring something beautiful and not for getting sad and thoughtful about the uncertainty of life which is expressed so clearly in the natural destruction of what has been created with so much effort. The following thought is almost unavoidable: Imagine how places look like after a war, after intentional destruction. That’s where we don’t really like to go, and alas, who knows how many steps we are away from such a scenario? What can WE do? – What can I do in the face of disaster? And here is a big “Thank You” to Ken Wilber who taught me to see the bigger picture and to appreciate the efforts which people do in one or more quadrants of reality. My attempt is now to bring together all these seemingly disconnected aspects and to realize their value and transmit what they bring to the table in service of a truly better world – and to help to diminish, or even end, the influence of the malevolent forces in power. Will you join me? And in case your house crumbles with the next earthquake, be sure to knock on my door!